Description: This setup prepares to leave Asheville, heading East. Description: A CSX train with no CSX painted locomotives.....interesting! Description: NS 37Q westbound at CP 53 on the NS Lurgan Branch. Description: Directly behing the 18N is the second section seen at Front St. Description: Not what you might expect to see on the former Cotton Belt in Arkansas. Description: 18th Ave., 0724 hours. Description: NS 31T is waiting at Phelps Street in Port Dickinson for 2 southbounds. Description: CP 931 starts his climb out of Binghamton with night setting in. Description: M7M accelerates west after waiting for CP 23T to clear the connection at CP 358. Description: 144-17 heads north on the NS Marion Branch at the MP-75 signal bound for Elkhart. Description: A pair of NS C40-9's heads up 144-17 near MP-75 on the Marion Branch bound for Elkhart. 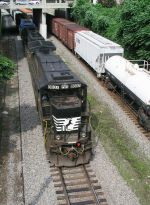 Description: NS 144-17 heads north at MP-75 on the Marion Branch bound for Elkhart. Description: EB NS train 32Q.